If you work in stand-alone mode, you automatically have the rights to modify all drawings and palettes. Harmony Network has a lock system, referred to as Global Lock, for the different scenes and scene assets. As all the data on the server can be accessed directly and modified from any client machine by default, the scenes are locked. The users must obtain the rights to modify scenes in order to save their work onto the server. Only one user at a time can modify a scene. 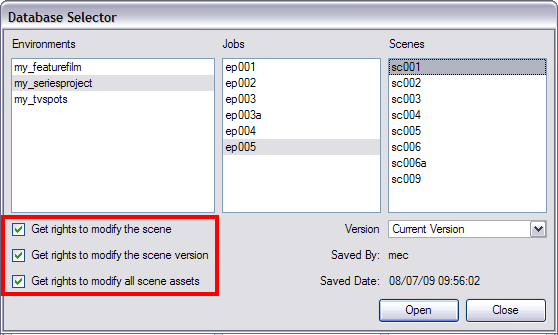 Once a scene is opened on a client machine, other users can only open the scene in read-only mode; they will not be able to save any modifications. Automatically gets all the edit rights for the selected version of the scene. This option is only recommended if you are certain that the selected scene cannot be opened for editing by several users at the same time. Large studios should avoid this option. These three levels of locking are available from the Database Selector when the user logs into Harmony. From there you can select a scene and obtain the rights to modify it by enabling the desired lock option check boxes. There are several different ways to obtain the rights to modify the scenes. It can be done when the user loads a scene from Harmony, inside the application once the scene is loaded, or when an environment, job or scene is created using the Control Centre module. Refer to the Harmony Server User Guide to learn more about Control Center. If you opened a scene for read only, but realize that you will need to modify it, you can easily acquire the necessary rights without closing and reloading the scene. ‣ In the top menu, select File > Rights to Modify Scene or Rights to Modify Scene Version. To learn more about enabling the rights to modify while creating environments, jobs and scenes, refer to the Harmony Server User Guide.